Ramona Mitrica started out in cultural entrepreneurship after many years of being close to this phenomenon in the UK. She recently launched a consultancy firm and publishing house through which she brings Romanian authors she translates herself on the market. She came to London in 1999, as the cultural attaché of the Embassy of Romania to the UK. After two years, Ramona changed her job from “the state sector” to one in the private system, when she was appointed the director of the Romanian Cultural Centre in London – an independent British organisation. In 2008 she created Profusion International, her own artistic consultancy firm, and in November 2011 she launched a private publishing house: Profusion Books, an independent British company, together with Mike Phillips. At the same time, Ramona was the director of the Ratiu Foundation, which was offering scholarships and cultural events in the UK capital. For Ramona Mitrica London also is a favourable place for entrepreneurship. In her opinion, the tax system is complex, but there are many facilities offered by the state or local authorities which make the entrepreneurs’ lives easier. Before coming to London, she worked for three years, until 1999, as a PR director at the Romanian Cultural Foundation in Bucharest. She read philology at the University of Bucharest, then theatre studies at the University of Theatre and Film, again in Bucharest. “I discovered that the experience accumulated working in the field of cultural promotion helps me enormously now that I work on my own. I remain in the cultural arena, it’s just that now I deal with discovering, translating and publishing good books in English”, adds Mitrica. She wants Profusion to be a successful business. 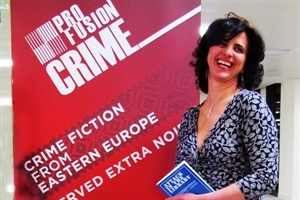 The first books edited by her company within the Profusion Crime series are the English versions of “Attack in the Library” by George Arion and “Kill the General” by Bogdan Hrib, launched in November 2011. This year, the two entrepreneurs will launch the translation of “Anatomical Clues” by Oana Stoica-Mujea, and the true crime book “Rîmaru – Butcher of Bucharest” by Mike Phillips and Stejarel Olaru. The Profusion series will also extend into the field of academic publications, bringing on the British market specialist works from Romania. The publishing house has a great number of collaborators, professionals from varied domains: translations, PR, advertising, marketing, strategy. Why books from Romania? Ramona Mitrica justifies her decision by saying she would like to present to the British audience cultural products through which they can see and understand another world, the world of Romania and Eastern Europe. “What we are trying to do with Profusion is to create a bridge between two worlds, starting from the so-called popular culture instead of the elite culture”, Mitrica also adds. The books published by Profusion are available in several bookstores in the UK – such as Waterstone’s Gower Street in London, and No Alibis in Belfast – as well as on the publishers’ website. In electronic format, Profusion’s books are available exclusively in Kindle version, through the Kindle Shop on Amazon.co.uk or Amazon.com, or via the localised versions for Germany, France, Italy and Spain. This entrepreneur knows all that is going on in the world of culture in London, and she visits a museum or an art gallery almost every day.